Darlington Recap: Denny Hamlin finished second in Saturday’s NASCAR Sprint Cup Series race at Darlington (S.C.) Raceway, leading four times for 56 laps to take the checkered flag behind winner Jimmie Johnson. Hamlin — the 2010 Darlington winner — battled a tight car throughout the 367-lap event on the 1.333-mile egg-shaped oval, but a late call to stay out of the pits by crew chief Darian Grubb gave him the necessary track position to contend for the race win. A pair of late cautions set up a ‘green-white-checkered’ ending, where Hamlin was able to move up to second at the finish line. The finish kept Hamlin fourth in the NASCAR standings following Darlington, 17 points behind leader Greg Biffle after 11 of 26 regular season races. All-Star Race Preview: Hamlin is making his sixth All-Star Race appearance on Saturday night at Charlotte Motor Speedway. The 31-year-old driver has three-consecutive top-10 finishes in the non-points, exhibition race, including a seventh-place result one year ago. Hamlin posted back-to-back fourth-place finishes in the All-Star Race in 2009 and 2010, and will look to take the checkered flag this weekend and the one million dollar first place prize. 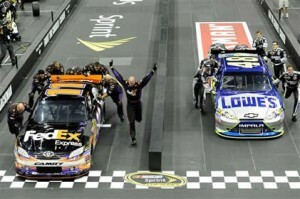 FedEx Pit Crew to Defend Title: The FedEx Racing team will look to make it three-straight titles in Thursday night’s Pit Crew Challenge at Time Warner Cable Arena in Charlotte. The #11 pit crew — made up of tire changers Mike Hicks and Nick Krizmanich, tire carriers Heath Cherry and Brandon Pegram, gas man Scott Wood and jack man Nate Bolling — have won the event the past two years. The team is led by pit crew coordinator Paul Alepa and Joe Gibbs Racing athletic director Mike Lepp. The team will race against other Sprint Cup Series crews to change four tires, add two cans of “fuel” and push the #11 FedEx Toyotaapproximately 50 yards to the finish line. Memphis-Germantown Along for the Ride at Charlotte: The FedEx Office location in the Germantown neighborhood of Memphis, Tenn., which leads the company’s President’s Club program, will be recognized with its “0512” store numbers on the b-post of the #11 FedEx Office Toyota this weekend at Charlotte Motor Speedway. How do you expect the racing to be in Saturday night’s All-Star Race? Are you going to be cheering on the FedEx team in the Pit Crew Challenge?